The #1 reason Fawakih students fail to advance in their Quranic Arabic journey is ironically their deep desire for perfection. I've seen students with average scores in the 70s go ‘slow and steady’ and end up reaching their goal, whereas others with near perfect scores take time off and never reach. They often consider repeating their level or taking a break to ‘master concepts on their own and join back some time in the future’. Unfortunately, that rarely happens. I get it; we’ve been taught that when building something, like a house, the stronger the foundation, the better the structure will turn out. Perhaps that’s the reason many don't want to continue forward until they achieve mastery. They may ask themselves: "How can I move on to the next level when there is still more to be done in my current level?" The best part about climbing a mountain is getting high and looking back at what you’ve covered. 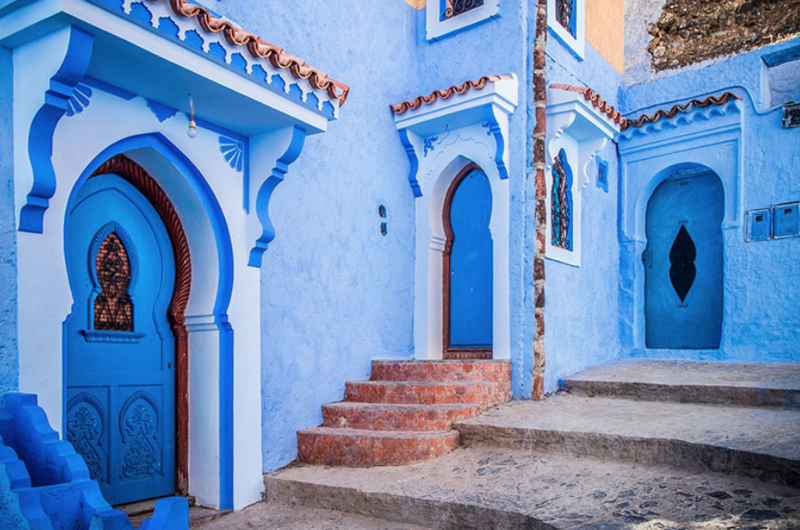 I remember climbing the mountain in Chefchaouen, Morocco with a couple of friends in 2003. We trekked up the gradual side of the mountain for many hours. Near the top, we came across a cliff overlooking the valley. We were amazed at how high we had climbed without realizing it. 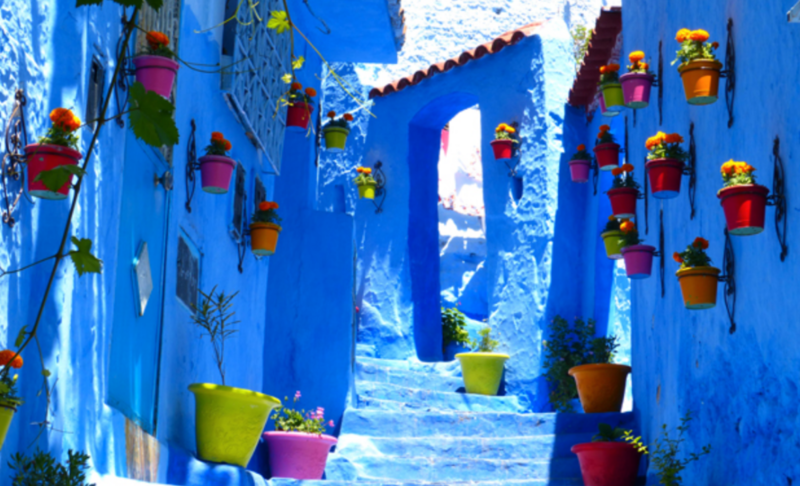 The magical, blue, and almost smurf-like (see pictures) town of Chefchaouen looked tiny. The best view of the lower levels could only be obtained from a higher level; as you near the journey’s end, the start begins to look easier and clearer. Looking back at this experience, I realize that learning Arabic is a journey, not unlike climbing a mountain. What I’ve learned from advising and observing thousands of students on their Arabic journey, the best way to solidify learning in your current level is to take the next one. Only from level 2 do you truly begin to appreciate your progress in level 1. By learning more advanced topics, the earlier topics sink in. It's as if the new content compresses the older content, making it look easy! Learning Quranic Arabic is a journey like climbing a mountain or running a marathon, not like constructing a house. There's no staying still, it’s either up or down, forward or backward. Either you are progressing and moving up towards the peak, or you start sliding down. The worst thing is to stop or separate from your climbing buddies. The way to the top is to keep moving together. Whether you go through a storm and are thrown off track for a bit or you are tired, keep moving, even if you’ve slowed down and are just inching forward. Once someone stops, it's very difficult to make it to the top. Ninety percent of students who take extended time off (more than 1 semester) their Fawakih journey never come back to finish their journey. Life happens. Like in a mountain climb, once you stop moving, the cold sets in and the doubts start creeping into your mind. It's very difficult to catch up and get back into it. You end up going to basecamp and waiting to hear stories from the others who made it to the top. I hope each and every one of you makes it to the top. The view is quite spectacular. Not only is learning Quranic Arabic a lifelong skill like riding a bike or swimming, but accomplishing something you felt you couldn't is the best feeling the world! Once you've overcome that fear, you'll feel like anything is possible. Learning Quranic Arabic is a messy process, not a linear path, with a series of breakthroughs and plateaus. It ends up requiring more heart than mind. Keep on climbing; I promise you that the view from the top will take your breath away!